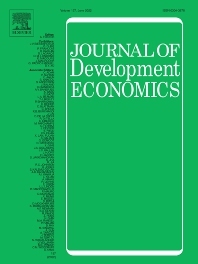 The Journal of Development Economics publishes original research papers relating to all aspects of economic development - from immediate policy concerns to structural problems of underdevelopment. The emphasis is on quantitative or analytical work, which is novel and relevant. The Journal does not publish book reviews. We welcome papers that take up questions in development economics that are of interest to the general readers of the journal, and then use data from a particular country or region to answer them. However, we do not publish articles that are essentially in-depth studies of a specific country, region, case, or event whose findings are unlikely to be of great interest to the general readers of the journal. In our review process we pre-screen all papers, some of which are immediately rejected. This includes papers that are not considered to be a good fit in terms of the topic or the methodology even though development is a broad field and sometimes this is a matter of subjective judgment. This also includes papers that fall short of our high standards, in terms of the contribution or value added to the literature, or in terms of methodological rigor. The Journal receives approx. 1300 papers per year and publishes only a small fraction (around 6-8%). To make this work in a timely fashion we only send 1/4 papers out for review. Given this volume we regret that we cannot provide explanations on our desk reject papers. Under normal circumstances, an author cannot submit (either s/he directly or through a co-author) more than three papers within any 12 month period. Papers that are once rejected by the JDE will not be considered for publication again, even if the authors use a new dataset or a new model. This is only possible if the editor in his or her decision letter explicitly leaves open this possibility. As part of a pilot project, the JDE now offers authors the opportunity to have their prospective empirical projects reviewed and approved for publication before the results are known (referred to as 'Registered Reports'). This pre-results review track may be particularly suitable for authors working on research projects for which they have not yet collected or accessed data. Submissions in this pre-results review track will follow existing policies outlined in the Author Information Pack, including the Mandatory Replication Policy, but specific information is available in the JDE Registered Reports Author Guidelines. This pilot project is supported in part by the Berkeley Initiative for Transparency in the Social Sciences (BITSS).